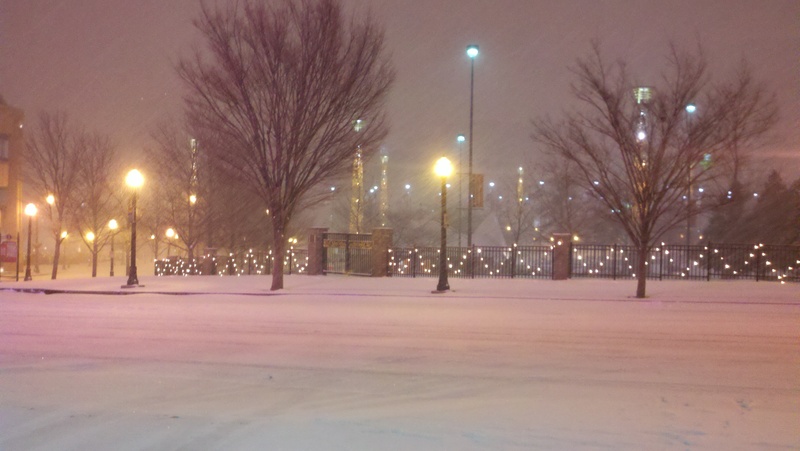 Some snow did fall in Atlanta and what a beautiful scene it was last night. Conversations were alive, describing how Atlanta would simply “shut down” for the snow. I thought to myself “Surely these folks couldn’t be serious.” By 10:00 there was a whopping 2″, maybe, with a steady breeze and the folks were right. Atlanta did “shut down.” The cars disappeared, including the taxis, retail establishments hurried customers out early and locked the doors and the sidewalks were empty….except for a cowboy from California, a couple from Michigan and farmer from Ohio. 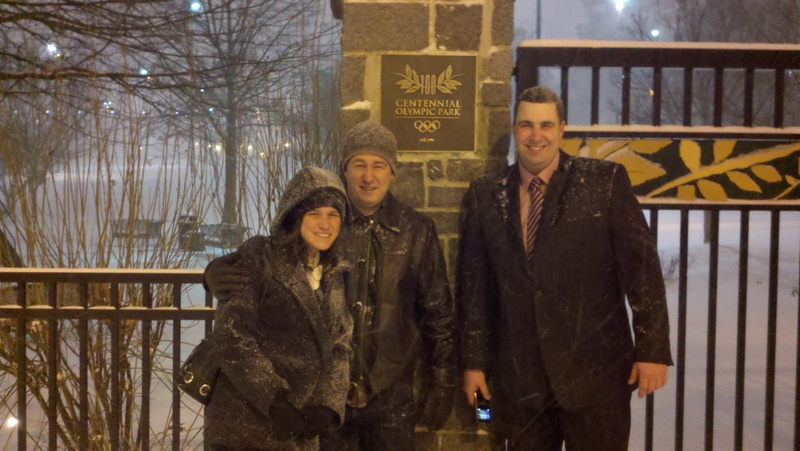 Our small group set out to walk to the other hosting hotel, the Hilton Atlanta. It was a very peaceful and serene walk. Snow was gently falling, a crisp breeze caressing our faces not a person or vehicle in sight. What had been a bustling city had been reduced to scene often seen on the cover of Christmas cards. It was quite a beautiful sight as we walked past the Olympic Park. In fact, we had to stop and take a picture. At the halfway point, I turned around and began my trek back to the Omni alone, not a car on the street, no one on the sidewalk. I had not walked more than 100 yards and a police officer pulled along side me. He then rolled up the window, slid a little bit and pulled away. I continued walking up the street and noticed a taxi stopped in the street on a slight slope with his hazards on. I crossed over to the cab and noticed the driver was still in the seat. I gently tapped on the window. He slowly rolled down the window and I saw a face that showed signs of fear. I crossed back over the street and continued my walk back to the Omni. Over the course of the next 15 – 20 minutes, I was stopped by three more Atlanta police officers, all very polite. It is good to see such friendly and pleasant law enforcement personnel in a city like Atlanta. I guess I might have stood out a little bit, being the only person walking on the sidewalk in a “snow storm,” wearing a cowboy hat and taking a leisurely stroll. The last officer understood completely. After a day of being inside, it felt good to get out and walk around, even if it was snowing a little bit. It just goes to prove that you can take the cowboy out of the country, but you can’t take the country out of the cowboy. I found your previous blog and followed on over here to this one. I am enjoying reading your posts. I am a wife of a farming “hopeful”, he is a disabled combat Vet, trying to break into the farming life. It is such a pleasure to find so many farming and ranching blogs that help keep us motivated. Looking forward to following along through your posts! I appreciate your kind comments. Best wishes in you endeavor and thank your husband for me for his service. God bless you both!